Second story floor: #50, engineered for future loft. 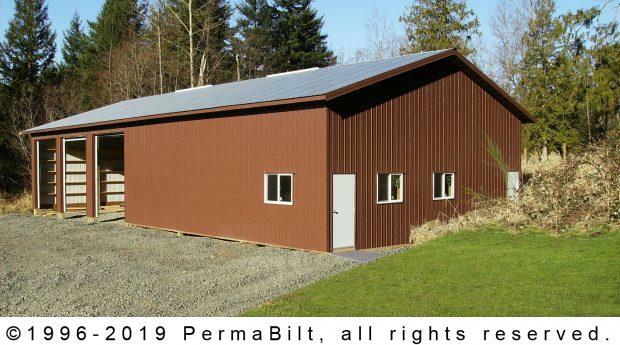 An Enumclaw Washington customer commissioned PermaBilt® to construct a large metal garage and outdoor storage building. Meeting with their PermaBilt®Building Representative, they discussed design, site location, budget and permits. They also spent considerable time discussing what the customer’s needs were and determining all the necessary accessories to meet the customer’s unique requirements for his new outdoor storage building. After deciding on a storage building design and signing the contracts, we obtained engineering and submitted for a building permit. After the permit was issued, the customer encountered some other issues not related to our project and needed to put the project on hold. The customer resolved their issues just in time to start the project before their building permit expired. The customer finally got the garage and outdoor storage building they had contracted for and was thrilled that we worked with them to get them their storage building.